As the capital of Uruguay, Montevideo is a major culture hub in South America. Everywhere you look, you see its historical bones, from the colonial mansions to the art-deco buildings and sprawling Spanish plazas. There's also stunning music to be found in the Solís Theatre, a neoclassical performance hall, and tons of high-end restaurants and steakhouses in the old port district, Mercado del Puerto. Whether it's your first time in the capital or you're a frequent visitor, there is always something new to discover. Here, the 7 best things to do in Montevideo. 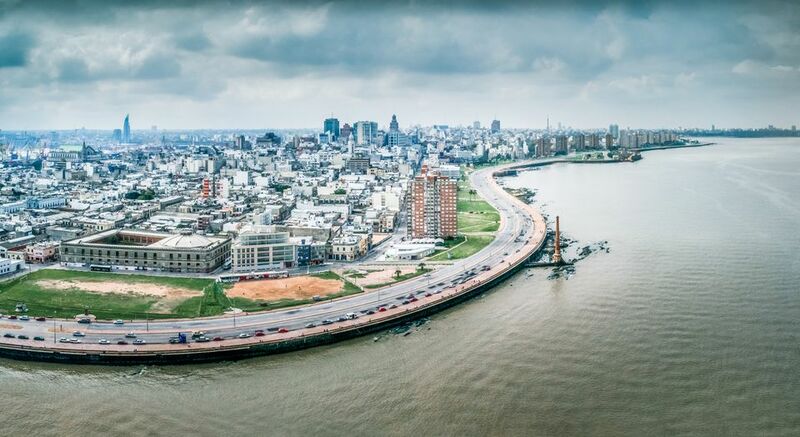 The settlement of San Felipe y Santiago de Montevideo began as a strategic military post to control the Rio de la Plata and the eastern seaboard of what is now Uruguay. Founded by a Spaniard, Bruno Mauricio de Zabala, between 1724 and 1730, to counter the Portuguese colony at Colonia del Sacramento, Montevideo over time became an important seaport. The Cerro de Montevideo across the harbor was both a navigational landmark and a defensive post. Montevideo eventually surpassed Colonia and became a vital, commercial and cultural city, the gathering place for Uruguay's leaders. Relaxing its military stance after many years of repelling Argentine efforts, Uruguay opened its door to European emigrants. Today, the city is the capital of Uruguay. One of the best ways to explore is to take a walking tour of the Ciudad Vieja, or the old colonial city, starting from the Plaza Independencia. Along the way, you'll pass the huge statue of Uruguay’s greatest hero, José Gervasio Artigas, that marks the spot of his mausoleum. The changing of the guard at noon is a popular sight. From there, visit the Palacio Estevez which until 1095 served as the Palacio de Gobierno. The 26-story building next to it is the Palacio Salvo, once the tallest building in South America. See the Teatro Solis, inaugurated in 1856 and the site of much of Montevideo’s artistic events. Connecting the Ciudad Vieja to modern Montevideo is La Puerta de la Ciudadela, the colonial military defense. Walk down Calle Sarandi to the Plaza Constitucion where you'll find the Iglesia Matriz, the earliest public building in the city. Many of its earliest residents were baptized there, including José Gervasio Artigas. Take time to wander through the Museo Romantico and Casa Lavalleja, both part of the Museo Historico Nacional. End at the Casa Garibaldi, where the Italian hero once lived. Arts enthusiasts should check out the Museo del Gaucho y de la Moneda, with its display of gaucho memorabilia, or the Museo Torres Garcia, which features the works of Joaquin Torres Garcia, an artist who spent much of his time in Europe. The museum showcases his unusual portraits of historical figures and cubist paintings reminiscent of Picasso’s works. When hunger strikes, tuck into a meal at the Mercado del Puerto, dating from 1868, and browse the arts and handicrafts shops. There are always strolling musicians and artists here. If parties and live music are more your forte, plan your trip around the city's many festivals. Carnaval in Montevideo isn’t as commercially popular as it is in Rio, but it’s always a special celebration. An important event is the Semana Criolla, in which participants recreate rural Creole life with equine activities, music, story telling, and song. Meanwhile, on February 2 at Playa Ramirez, Uruguayans who share an Afro-Brazilian heritage gather to celebrate Iemanjá, the festival of the Goddess of the Sea and Mother of the Waters, with candles, flower offerings, and music. You can also pay your respects by spending a few days in the sun along the sandy beaches of Montevideo or by planning a weekend at any of the resorts along the Gold Coast and the Uruguayan Riviera. Uruguay is stunning year-round as it has a pretty moderate climate. The weather is typically pleasant, though sometimes can be rainy. However, if you want to be outside or by the beach during your trip, you may want to consider visiting during Uruguay's summer months, between November and February. For budget travelers, it's best to book on the shoulder seasons when you'll find more hotel deals and lower airfare rates.